With the help of technology and the cloud, more and more offices are looking for ways to go paperless. 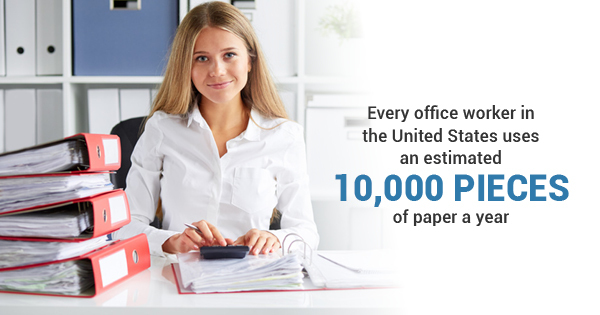 Given that every office worker in the United States uses an estimated 10,000 pieces of paper a year, it's a worthy goal. Not only can offices help save paper and trees, but office supply costs could also be greatly reduced. And, of course, the issue of misplaced and lost paper documents would be eliminated completely. Document scanning and document storage systems that are cloud-based are one great way to do this. Another option that many businesses are turning to is that of managed print services. There are many benefits of print services and outsourcing your printing needs to a company that deals in managed printing solutions, which we'll get into below. Managed print services takes over all of the printing needs of a business and takes control of the printing devices and infrastructure. They'll handle output, supplies, and gives you better insight and control into how document processes work and what the real cost is. Steps can be automated, costs can be regulated and reduced, and document security is improved, not to mention the positive environmental impact. Given that printing can be as much as 15% of a company's spending every year, getting a handle on how much you're printing (and why) can have a big impact. Printer and copier costs are usually the third biggest expense at a company, after rent and payroll. And StopWaste.org reports that almost 20% of everything that gets printed is simply a waste and didn't need to be printed in the first place. Managed print services help your business reassess the printing you're doing. What are the Benefits of Print Services? For one, you'll have a much better idea of what your overall printing costs are. Managed print services will do a print assessment and take a look at the current operating costs. After that, they can recommend ways of streamlining and controlling the way things are done. Better document security also comes as one of the benefits of print services. Things that were previously paper-based can be converted to digital processes for better efficiency and increased security. The best kind of managed printing services will integrate seamlessly into your existing IT software and their systems use authentication techniques, encryption, and strong virus protection software to keep your information secure. Productivity can also be increased, since certain steps can be automated. According to Interact, almost 20% of time at a business is wasted because employees are looking for the right information that will help them be most effective at their job. Cutting down even a small portion of that with managed print services can make a big difference overall. And of course, another one of the huge benefits of print services is reducing your office's footprint. A more simplified and streamlined workflow means less waste, which means less paper, which means less need for that resource. How Can I Start With Managed Print Services? Most managed print service companies will come in and run a requirement assessment to see where they'd be starting from. They'd then replace the hardware that's already in your office, either partially or totally. After that, the service provider will make sure that the necessary hardware, parts, and supplies are sent to your business, and will keep tabs on any issues, the overall user experience, and how much use each component is getting. There are likely managed print services available in your area and colleagues or other business contacts might have recommendations. It's always advisable to talk to a few different companies, get quotes, and learn about their processes to see who the best fit is for your business might be. Switching to managed print services can make a big difference in your business's costs, efficiency, and environmental footprint! As more and more companies make the leap, consider what your business needs to stay up to date.